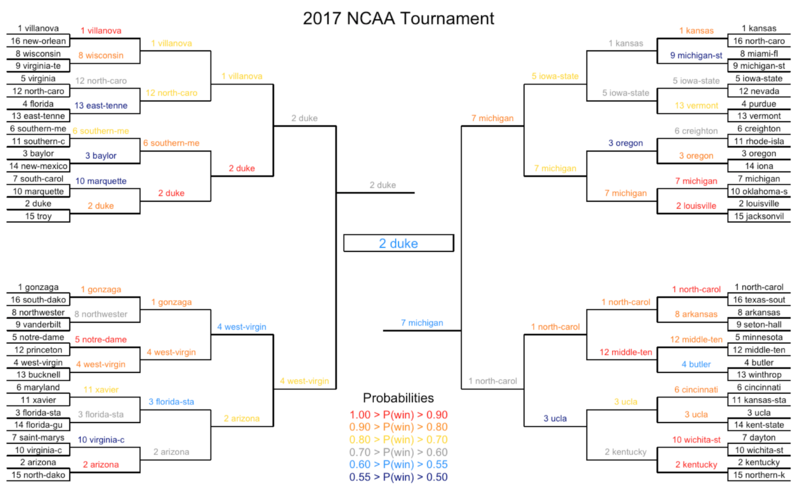 The following bracket contains our consensus predictions for this year’s tournament. 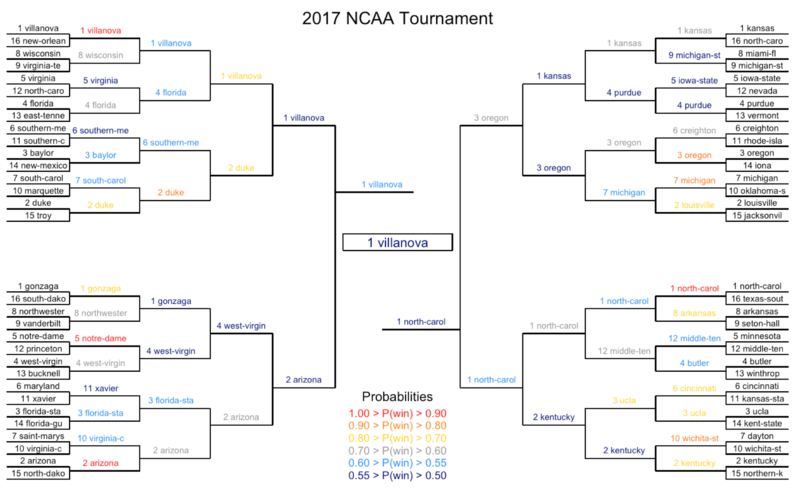 For each matchup, we considered predictions from all of our win probability and point spread models, as well as the results of a simulation of 60,000 tournaments. Beyond the consensus bracket, we have also included links to brackets from each individual model, which are listed in order of historical accuracy (the most accurate model is “Model 1” and the least accurate – but still good – is “Model 6”). 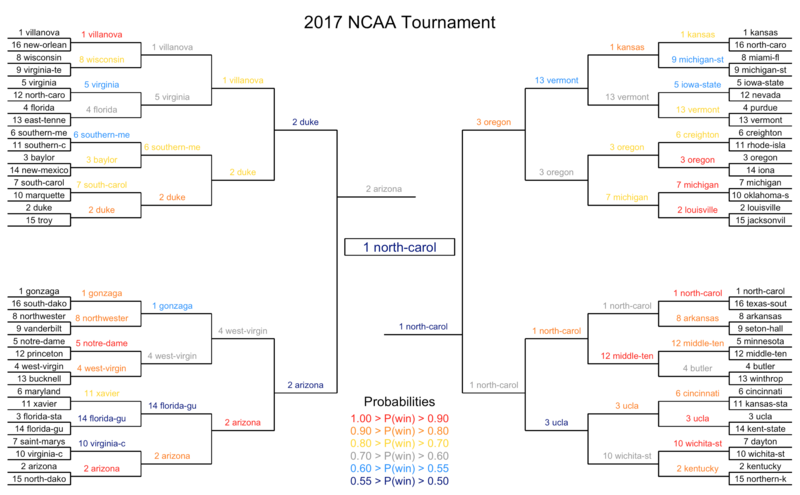 Model 1 has predicted 11 of the past 16 champions correctly and has predicted at least 2 Final Four teams correctly every single year (it had Villanova and North Carolina last year). 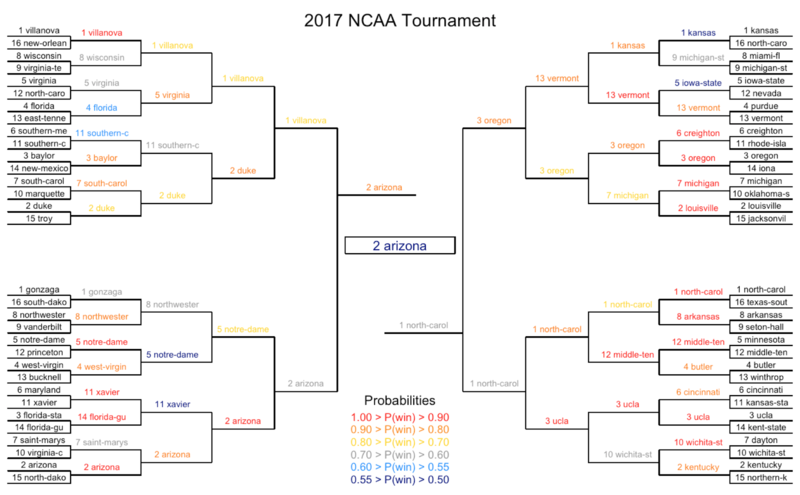 For 2017, this model is very similar to our consensus bracket, and has a Final Four of Villanova, Arizona, Oregon, and North Carolina, with Arizona taking down UNC in the championship. When Arizona loses in the first round, you can find me in a dumpster behind Arby’s…. 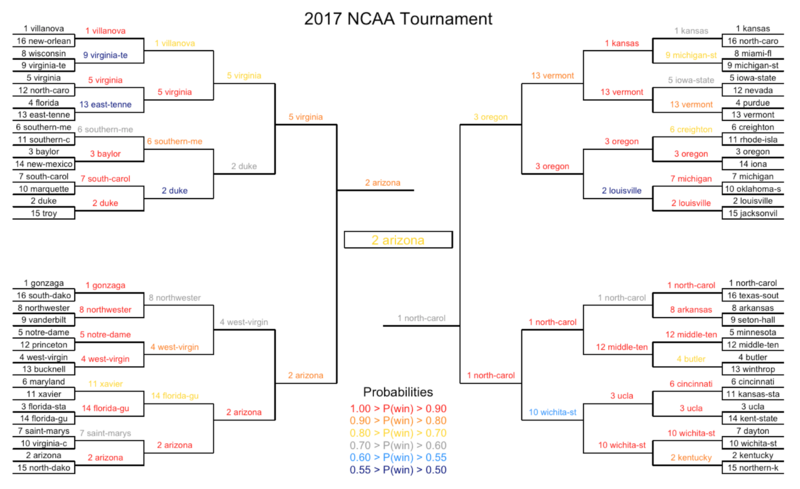 It makes things easier when the models agree with each other, and there are a lot of games where they do, but, unfortunately, that is not the case for the entire bracket (it rarely is). You’ll see that there is disagreement among the models, especially when it gets to the Final Four and beyond. 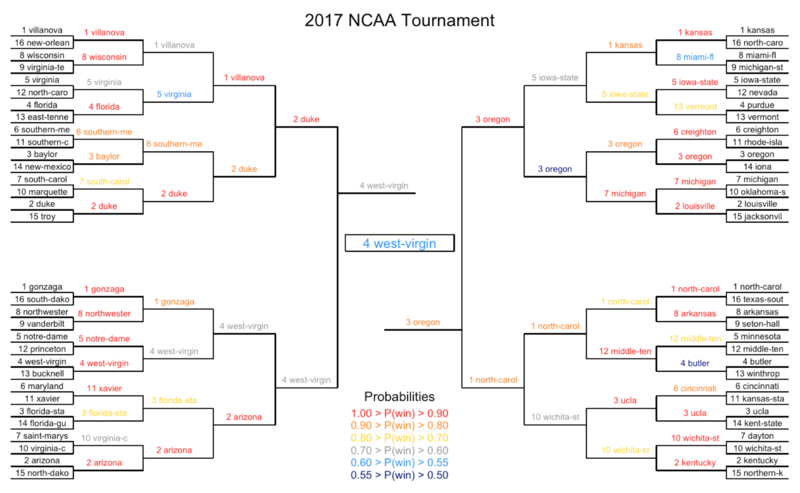 This fits intuition, as a common story line of this year’s tournament is that “there is not a clear-cut favorite.” The current Vegas odds to win the title agree, as there is a close grouping of teams at the top, with odds between +650 and +900 to win the tournament (UNC, Duke, Kansas, Villanova, Gonzaga, and Arizona). For games where there is disagreement among the models, we looked at the average probabilities from all models, as well as the predictions from the best model (Model 1). For more background on these models, check out this article. 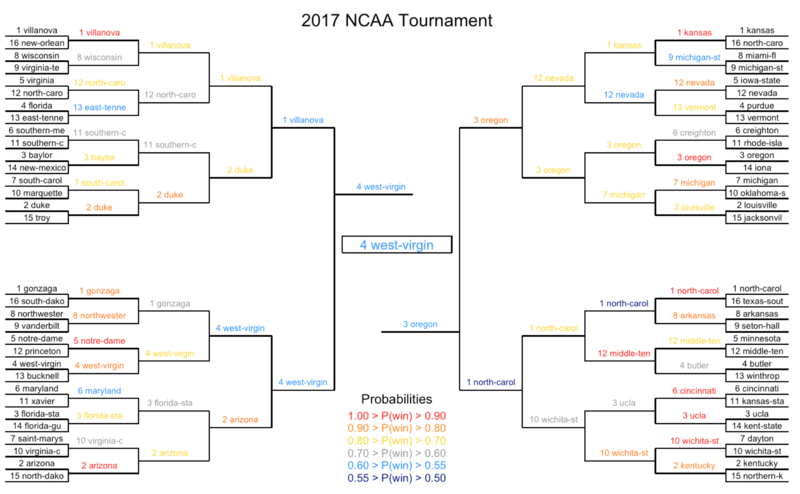 Whether you use these predictions to fill out your whole bracket or just to decide between a few close matchups, we wish you good luck! Check us out on Twitter and Facebook for updates on new content.